It's the second Wednesday of the month, and that means it's time for another edition of the Blogger C.L.U.E. Society. This month we rummaged through our assigned blogs looking for recipes featuring fall fruits, and my assigned blog was Kelli's Kitchen. I had such a fun time rummaging through Kelli's blog in search of the perfect thing to make. 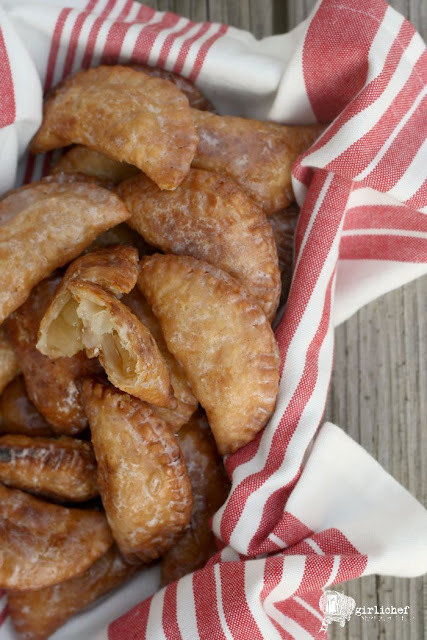 On her about page, Kelli says that she learned all the best things in life from her Nana, so I'm pretty darn excited that the recipe I chose to make this month is one that her Nana used to make—small fried apple pies. These little hand pies remind of the hot apple pies at McDonald's that I loved as a kid and the kind of little pies that slide out of a little cardboard box (that I always hope will be good but never are). The only difference is, these are MILES better than either of those options. Honestly, I couldn't stop eating them. It was a really bad idea for me to make them in the morning when everybody else was off at school and work. I had to force myself to leave the kitchen just to put them out of view. Kelli lists sugar and cinnamon as optional ingredients in her recipe, noting that she left both out of hers since she wanted them to taste as close to her nana's as possible (because they were both expensive and hard to come by during the depression, and she never put them in years later). I actually put a little sugar, cinnamon, and a couple of other spices in the filling; I also dipped the warm pies in the glaze to get a thin coating on the entire outer surface. I hope that Kelli and her nana would still enjoy them. I know my family will for years to come. 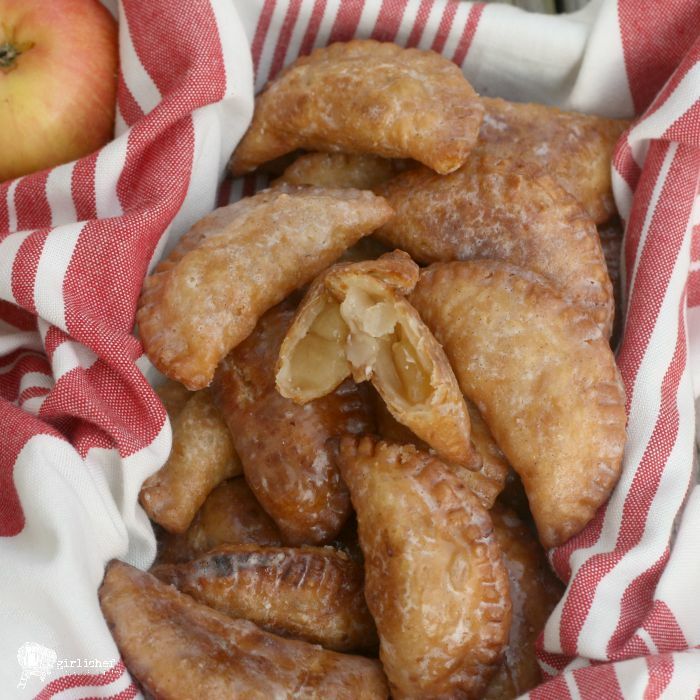 Apples and spice are enclosed in pie crust, fried, and covered in a thin layer of glaze in this mini fried apple hand pie recipe. Set a large skillet over low heat and add the apples, sugar (more or less to taste), and spices. Cook, stirring and mashing, until the apples look like chunky applesauce. You should have at least 1 1/3 cups of filling. In the meantime whisk all of the ingredients for the glaze together in a small bowl. One at a time, roll each round of pie crust out on a lightly floured cutting board until it is between 1/8-inch and 1/4-inch thick. Use a 3-inch biscuit cutter to cut out circles; re-roll the dough and cut out more circles. Repeat with other disc of dough. You should get about 15 circles out of each dough half. 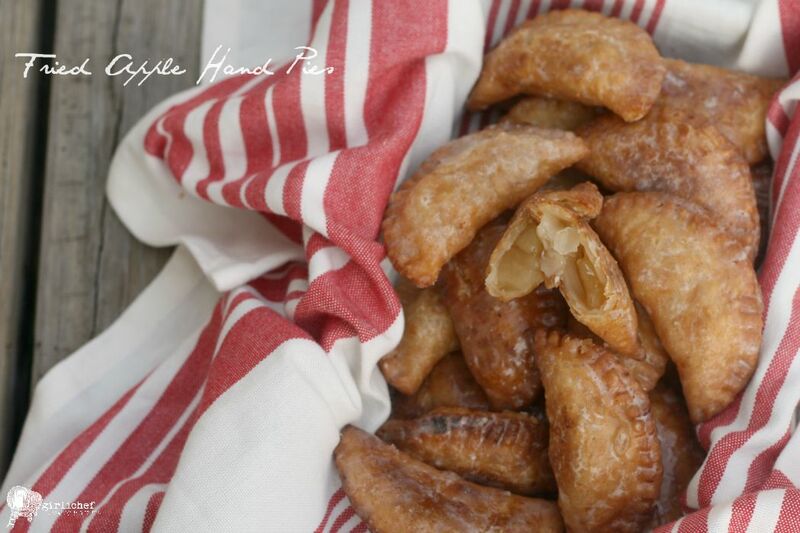 Place a small mound (~1 1/2 teaspoons) of the cooked apples into the middle of each round. 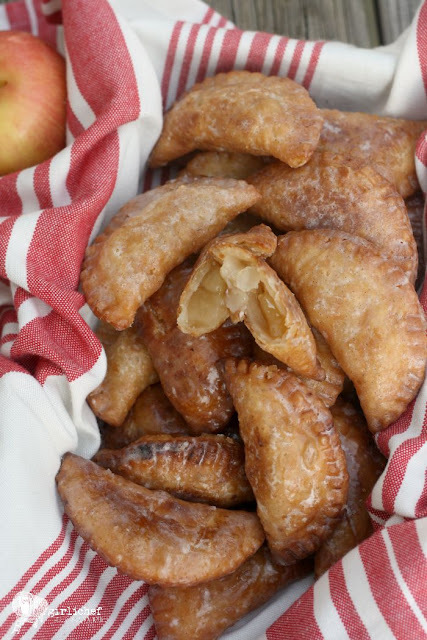 Dip your fingers in cold water, then wet the crust all the way around. 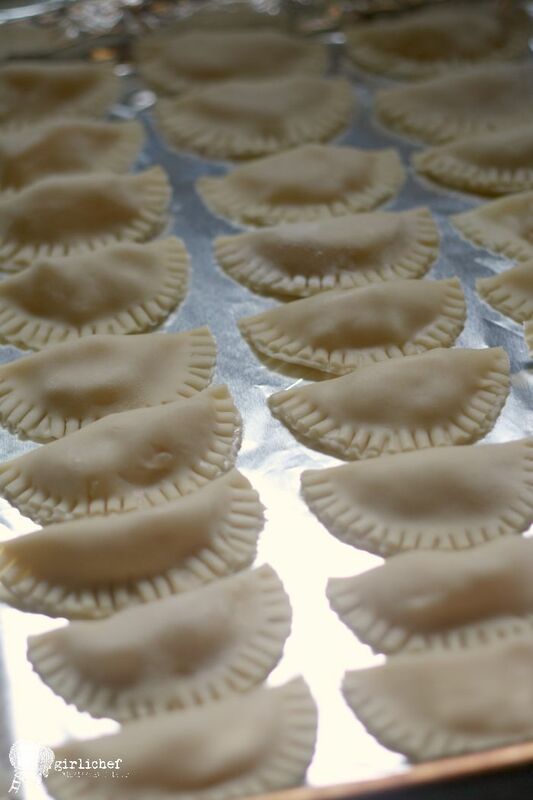 Fold over the filling and crimp the edges to seal. Pour oil to about 1/4-inch deep into a 10-inch skillet with deep sides; set over medium-high heat until you can just see ripples on the surface. 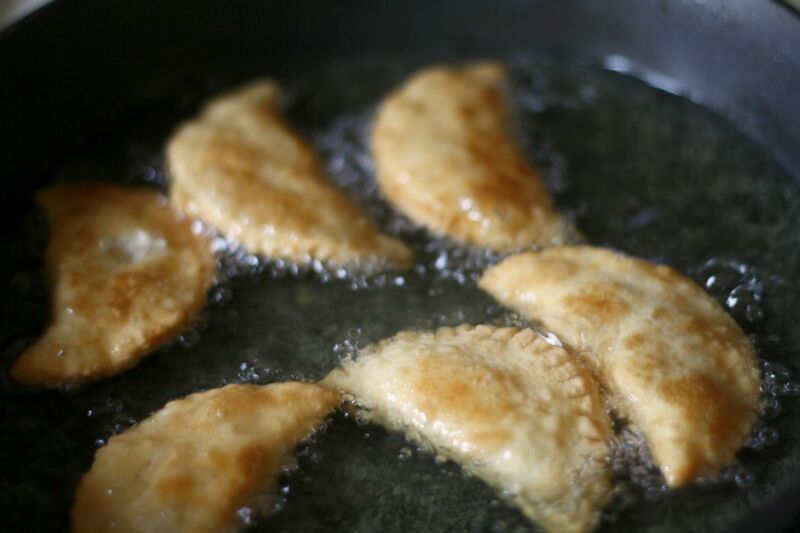 Very carefully slide enough some of the mini pies into the hot oil, taking care not to crowd them. Fry for 2-3 minutes total, flipping halfway through, until golden. Transfer to a wire rack that is set over a paper towel-lined baking sheet. Repeat with remaining pies. When the pies are still very warm, but cool enough for you to handle, quickly dip each one in the glaze, then set back on the wire rack to finish cooling (I dip one batch while the other is frying). Enjoy warm or at room temperature. Store any extras in a brown paper bag or airtight container once completely cooled for 1-2 days. Today is reveal day, and this month's theme is: Fall Fruit. Join me in reading about the food hunted down this month in the #bloggerCLUE member's kitchens!